A rapid diagnostic test for multi-resistance to broad-spectrum antibiotics has just been developed at the University of Fribourg. Prof Patrice Nordmann and Dr Laurent Poirel of the Medical and Molecular Microbiology Unit have been collaborating with Unit 914 of the National Institute of Health and Medical Research (INSERM) in Paris, of which Patrice Nordmann is also Director. This new test allows the identification, in less than two hours, of multidrug-resistant strains of Acinetobacter baumannii, an important hospital pathogen. The large-scale application of this test will mean better control of the spread of certain traits of antibiotic resistance. Bacterial resistance to antibiotics has increased considerably over recent years. The situation is particularly dramatic in regard to gram-negative bacilli (Escherichia coli and Klebsiella pneumoniae, Pseudomonas aeruginosa and Acinetobacter baumannii), in, for example, septicemic and abdominal infections and infections of the urinary tract and the lungs, considered to be the most frequent human infections in 2014. There are already signs of a real therapeutic impasse. Extremely broad-spectrum antibiotics, such as the broad-spectrum cephalosporins and the carbapenems, antibiotics of last resort, are already proving totally ineffective against certain strains of bacteria. It is estimated that in Europe the total number of deaths associated with multi-resistance to antibiotics is 25,000 annually. The rapid development of this resistance risks compromising whole areas of 21st century medicine which require effective preventative or curative antibiotics for transplants and major surgery as well as resuscitation. When a bacterium hydrolyses an antibiotic, it deactivates the way it works in some way. It is this phenomenon which had already been targeted by two rapid diagnosis tests developed by Patrice Nordmann and Laurent Poirel. These tests detected the presence of extended spectrum Beta lactamase enzymes and of carbapenemases (which hydrolyse wide-spectrum cephalosporins and carbapenems in Enterobacteriaceae and Pseudomonas aeruginosa, respectively). Now the two researchers have developed the CarbAcineto NP test which allows the detection of carbapenemase activity in A. baumannii; and it is this carbapenemase activity which is systematically associated with multi-resistance to antibiotics in this type of bacterium (click figure to enlarge). The test is based on the acidification properties generated by the enzymatic hydrolysis of a carbapenem, Imipenem, when it is cleaved by a carbapenemase. The medium acidifies and the acidity (pH) indicator then turns from red to yellow. The detection of this carbapenemase activity can be realised by testing already isolated bacteria or any site infections. The result is obtained in less than 2 hours, while other techniques currently available require a minimum of 24 hours, most frequently 72 hours. The sensitivity and specificity of the CarbAcineto NP test is close to 100%, a value rarely achieved by a diagnostic test in medicine. The development of the CarbAcineto test is an important contribution to the struggle against the emergence of antibiotic resistance. It is simple, cost-effective and, by detecting multidrug-resistant strains, it can prevent them spreading via outbreaks of hospital infections caused by multidrug-resistant bacteria, particularly among the most seriously ill patients - those undergoing resuscitation. This new test also provides a guide in the choice between the very few remaining treatment options for infected patients. 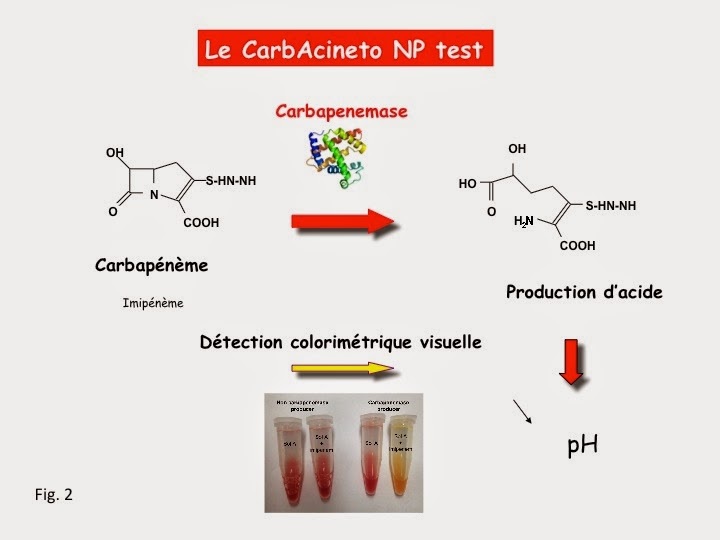 Reference: Laurent Dortet, Laurent Poirel, Caroline Errera, Patrice Nordmann, CarbAcineto NP test for rapid detection of carbapenemase producers, Acinetobacter sp. J. Clin Microbiol, May 2014.